January – March: the MCM will be hard at work adding murals, street improvements and talking to the community around Bartlett. Stay in touch for mural markets – special evenings to celebrate new murals. April 7th: Spring Back with MCM’s 2011 Grand Opening. 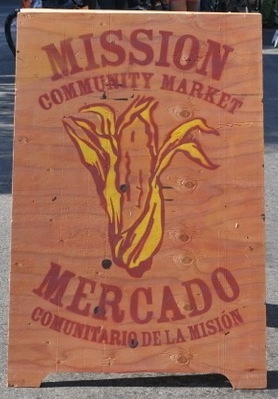 This Thursday is the Last Market til April 7th! Join us for the Last MCM of the season!! Last chance for holiday gifts, pickled veggies, jams, sweets, soaps, bath salts, crafts, and art. In the off-season, the MCM will be working hard with the neighboring residents and businesses to make Bartlett Street safer, more beautiful and more fun! Check back for murals soon!! 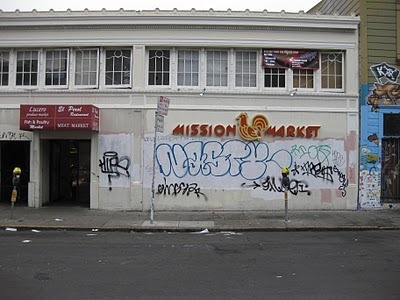 Donate to support the MCM’s return in April, community murals and a re-designed street. Volunteer in the off season with building, crafts, translation, design and outreach. What’s YOUR vision? 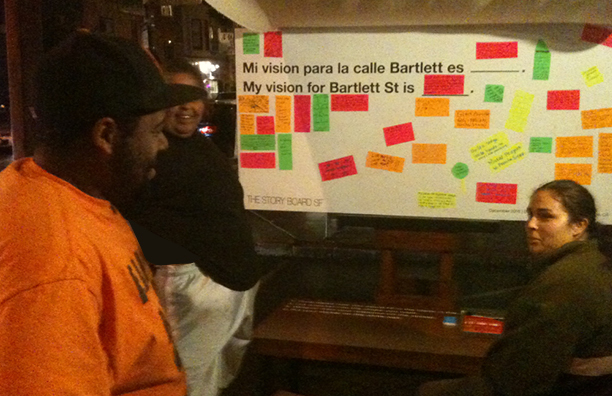 Take a minute to stick your visionary idea for Bartlett Street or the MCM on Storyboard SF. More public art? Different street design? More this, less that?? Your turn to tell. Hosted by Chris Treggiari. 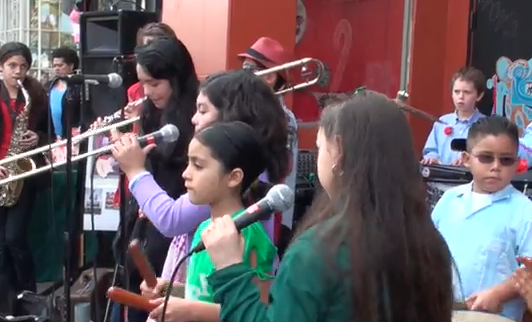 After you pick up your Blue House brussels, stop for some other little sprouts: Chiles Verdes, the youth band from the Mission Cultural Center for Latino Arts. Directed by Jose Leon. Tell us your vision for the MCM and thoughts on Bartlett Street! This winter the MCM will be working hard on your ideas to improve Bartlett Street. Tell us what you see in the future for Bartlett! And while you’re at it, drop a thought on the MCM. The Story Board for your thoughts is hosted by artist Chris Treggiari of Root Division. It will be here December 2, 9 and 16. Hasta la tarde! Diganos su vision para la calle Bartlett y el Mercado Comunitario! En el invierno, el Mercado trabajara en sus ideas para mejorar la calle Bartlett. Que es su vision, que son sus ideas para el futuro de la calle y el MCM? La cartelera de sus ideas es presentado por Chris Treggiari de Root Division. Estara en el mercado el 2, 9 y 16 de Diciembre. See you Thursday afternoon!